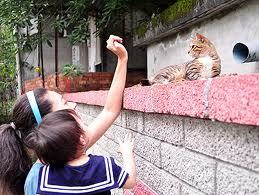 Nancy M. West: Japan's Whimsical Cat Island Gone? The human loss and suffering in Japan is heart-wrenching and tragic beyond words; however, since this blog is devoted to cats, and feral cats in particular, I want to say a brief word about Cat Island. Tashirojima, or "Cat Island" is a small island off the coast of northeastern Japan. It was once a bustling fishing village, but has, over the years, become popular with tourists who want to see the 100 or more beautiful cats that freely roam the island. These cats are cared for by fewer than 100 residents, who are mostly elderly villagers. These cats are revered for the prosperity and the good fishing they are believed to bring to the community. Cat Island even has a“Cat Shrine” near the center of the island where locals and tourists can pay homage to these local felines. Today, I am offering a prayer to the Goddess Bast that the cats of Tashirojima maintained their talisman power, and that the island and its residents have survived this horrific tragedy.